For the quality aluminum alloy material and strong joints and connectors, this portable picnic table always keep durable and stable. The camping table is lightweight and easy to set up. Besides, the roll up table could be fold down and store in the carry bag to be taken any where. We Forbidden Road always value the customer user experience. Please kindly leave feedback and rating below. Great Size for Family Use - The portable folding table measures 27.5" x 27.5" x 27.5" (69cm x 69cm x 69cm), which is a great size for family or friends for indoor and outdoor activities. 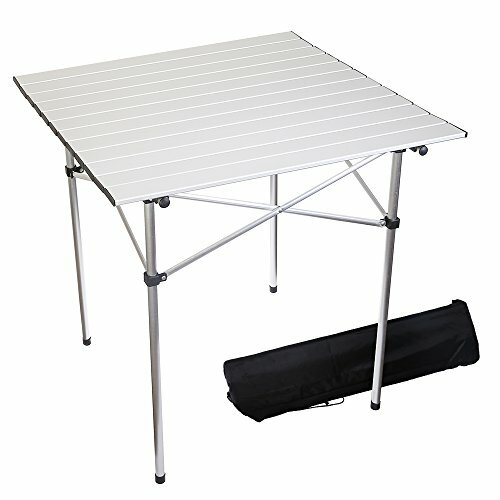 The outdoor folding table top is big enough to put some camping necessities such as food, drink and leisure and entertainment supplies. Take additional 4 camping stools, men and women could seat down to enjoy a nice camping experience. Stable and Durable - Both the table top and frame adopts quality aluminum alloy material, the folding table for camping is strong and durable, not easy to be broken. Besides, the outdoor folding table is constructed with strong joints and connectors, which make the portable table durable and stable and hold up to 33lbs / 15kg. Suitable for Multi Activities - For the lightweight and easy carry features, the portable folding table is an ideal equipment for both indoor and outdoor activities such as camping, hiking, picnic, patio, garden BBQ, beach, fishing and more. Take the lightweight folding camp table out with family or friends, enjoy a nice outdoor time. If you have any questions about this product by Forbidden Road, contact us by completing and submitting the form below. If you are looking for a specif part number, please include it with your message.